It is said that missionaries are at a steady state of stress. We felt it when we moved here but we can often forget because the state of stress just becomes normal. The increased threat of terrorism, the conditions of the traffic and the reckless driving, the worry over the ministry and the constant pull of things begging for our attention. It's endless. I was reading a blog (http://blogs.ntm.org/brian-pruett/2012/03/23/just-how-stressed-are-missionaries-and-what-can-we-do-about-it/) that stated, "Back in 1999, Drs Lois and Larry Dodds (of Heartstream Resources) were studying the levels of stress on the mission field, using a modified version of the Holmes-Rahe Scale. In Holmes and Rahe’s original study, they found that if you reached a level of 200 on the scale in a year, the cumulative stress would have consequences for some time to come. In fact, they found that 50% of those who reached this level were hospitalized within two years. The reasons included heart attack, diabetes, cancer, and other severe illness. So, the Dodds wanted to find out what the typical missionary went through. As you might have guessed, the news wasn't good. The typical missionary had not just peaking levels above 300 – they had sustained levels over 300 – – – year after year. The typical missionary, in fact, had [peaked at] double that level – 600 on the scale!" All to say, the Calvary Chapel Missions Retreat came at just the right time for us! Jeff and Madeline Schlenz from Calvary Chapel DC Metro came to encourage us. I just wanted to share some things that encouraged us in our work out here: Jonathan and I were encouraged in these words: "We are called to a difficult work, but you are not alone and God says you will win." Our hearts cried, "Amen!" as we agreed when Jeff pointed out "We will be tired in the work but not of the work." 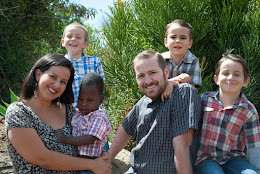 We were encouraged to remind ourselves of how we came here five years ago: We were brought out here to Kenya by some miracle of God, we scoured the scriptures in search of confirmation, we were at a heightened alert, looking for continued confirmation that God, indeed was speaking to us about our move to Kenya. We doubted at times but the evidence that God was speaking to us concerning Kenya was overwhelming. Once we received the call to go, it was confirmed by Godly men and we were sent out not "only by God but in support of those we loved and have called us "brothers and sisters". We were encouraged to refresh our memory on the work we do now: "There was once a time where we looked up to this time, where we are and what we are doing." To revisit this truth clears out the weeds of the "daily gardening". When we go outside to the garden (the ministry), the garden in many ways looks the same as it did yesterday. It's hard work. It's stressful work. But it's glorious work. We were encouraged that just like Timothy, we will have frequent infirmities with no healing. But we press on. I know that doesn't sound so encouraging but when we read in the book of Acts how the early apostles suffered the same, we feel encouraged that we don't stand alone. We were encouraged to work hard and then rest. Such a simple but difficult truth when we don't have a "clock in" and "clock out" time. The work we do can be constant and "inconvenient". But that is the work of a shepherd who tends the flock. True shepherds will stay in difficult times and the sheep don't always know what it cost the shepherd. I'm certain we can't even begin to grasp what it cost Jesus, the good shepherd (John 10:11) to tend to the sheep and ultimately die for the sheep. We sat together as fellow Calvary Chapel missionaries, laughed at our mistakes, cried with each others over heart breaks, held each other’s hands when we reminisced over loved ones so far away and prayed together for strength to continue on. We left our annual Calvary Chapel Retreat, committed to God's work, remembering our calling and committed to pray for the work each one is involved in here in Kenya. I encourage you to pray with us to stand strong. We have seen God at work through Calvary Chapel with several church plants. It's invigorating to be a part of. We are alive and awake in the work God has for us. We desire to be no where else but in the hand of our Lord. Please stand with all of us in prayer. Be a part of the work here.